Bring along your talent, entrepreneurial spirit and drive to make an impact on the lives of billions of people around the world. At L’Oréal we give you the tools to develop yourself as you help develop our portfolio of powerhouse brands. L’Oréal is offering two exciting internships in Paris. One on the HR department and the other on the Digital department. Passionate about people? Seeking an impact? Want to become a people champion and strategic driver of the business? Ready to lead the change on the development of our talents and on your own career? Then our internship mission in Human Resources is just right for you! Passionate about digital? Seeking an impact? The words Brand Content, Influencers, e-Commerce and Data sound exciting to you? Then our internship mission in Digital is just right for you! Inspiring advice from Pavel, Global Employer Brand Manager at L'Oréal. What do you believe, is an important aspect of an engaging company culture? The answer is not a better espresso machine or a weekly office happy hour (even tho that’s a good start :). It’s not even about better flexible working hours. The key is building a team environment that supports day-to-day collaboration and where you feel you belong. It’s about an environment where you get to express ideas and test them quickly. It’s about having challenging new projects that help to progress as an individual and a professional and not stagnant. It’s about having an environment where structures are not too strict. Because in the end we all want to feel that we can take work as if the company is our own, not just some place we’re working. It’s about a culture where we are all acting as one. Your advice for a student who wants to kick-start their career? During your 20's stop worrying that every decision would have irrevocable consequences and that there was only one path. The truth is that there are many paths, and what looks like a setback today may next year turn out to have been a great advantage. Take your time to think about what makes you tick. Your interests and skills. What you enjoy doing and why. Things you are less good at or don’t enjoy. And then decide what steps you need to take to get more information about your favorite options from your friends, peers, mentors, to improve your chances of success. It’s important to be focused. There will be many bumps along the way, but don't get distracted by the zigzags in the road. Vision and passion are very clear; if you believe in something, other people will too. Always compete with yourself, not the competition. If you're constantly using other people as the yardstick to measure your success, you're not putting your energy and passion where it belongs. You're the only person who can determine how successful you will be. Always remember that hustle will be there to achieve something you really want. Curiously enough one of the most memorable was the first project at L'Oréal. I joined the company 5 years ago as an intern right after the successful participation in L'Oréal Brandstorm case championship. From the very beginning I realized the positive gap between assumption and reality with my intern's duties and atmosphere. Instead of simple tasks I got my own project of social networks pages launch and optimization. The whole project was on my shoulders, I was exposed to the country HR Director to get his vision, so for me it was like running a small start up when there are «clients» who use your product and «investors» who are curious about the results. It was a momentum when I've grown up professionally and personally, got practical things and I realized that people around me are very inspired by making the difference and this is something I find and see every day. Last summer, while taking a break from studying Marketing and Entrepreneurship at the Carroll School of Management in Boston, Theo took up the Marketing summer internship at L’Oréal in New York! We call this area the “Learning Lounge”. Teams on the floor will head over to this space when they want to have informal meetings to brainstorm, or just spend sometime working with someone else on the floor in a more relaxed environment. I would wake up knowing every single employee in my company. A big part of getting a project done here is understanding who to reach out to for necessary information. I meet new employees and teams with almost every project I’ve been given, so hopefully I can wake up in a few years and have that be a reality! I would want to work with Mark Cuban. He is extremely entrepreneurial and he is always one step ahead of investing in the next big trend or business. I always enjoy hearing his justification for investing in Shark Tank proposals because they are extremely strategic, and he always provides honest feedback to those he passes on. He is also one of the more personable judges. His investments are in a medley of businesses and projects which has made his expertise vast, and it shows he enjoys taking on a new challenge. He is also passionate about his companies and projects which you can see from the growth his teams and most companies have had since his involvement. His leadership, vision and personality would be a great fit on any team within our company. 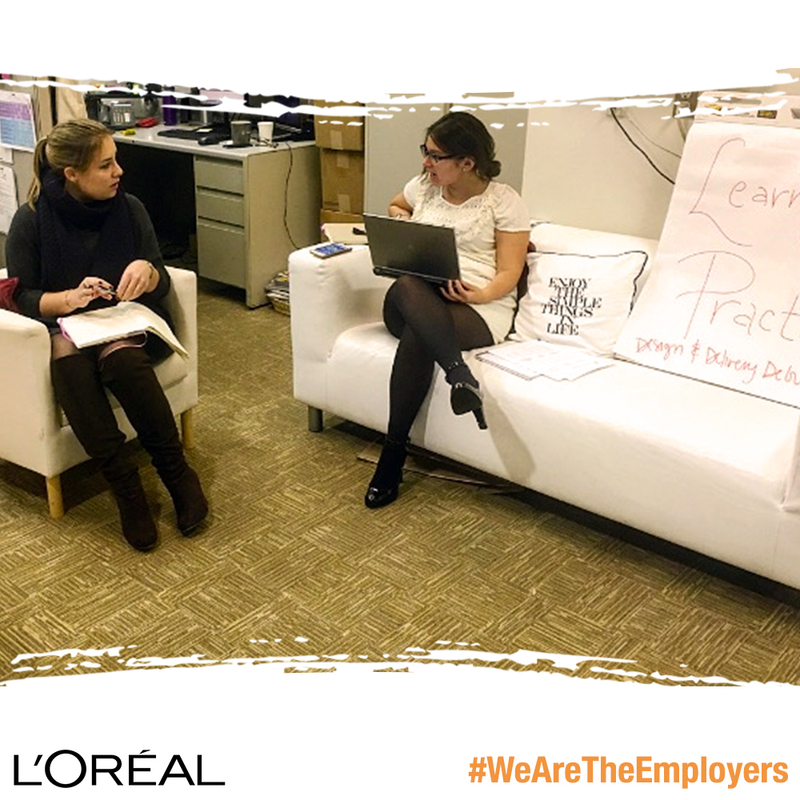 What advice would you give to students wanting to join L'Oréal? The best advice I could give is to really embrace the internship and take advantage of the networking and learning opportunities offered throughout the summer. You never know when meeting with someone will lead to a great idea for your project, or an opportunity to be invited to an exciting event. It is a very fast paced internship, but you will leave with a better understanding of the business, your strengths and areas for development, and how to manage projects on top of day to day responsibilities.